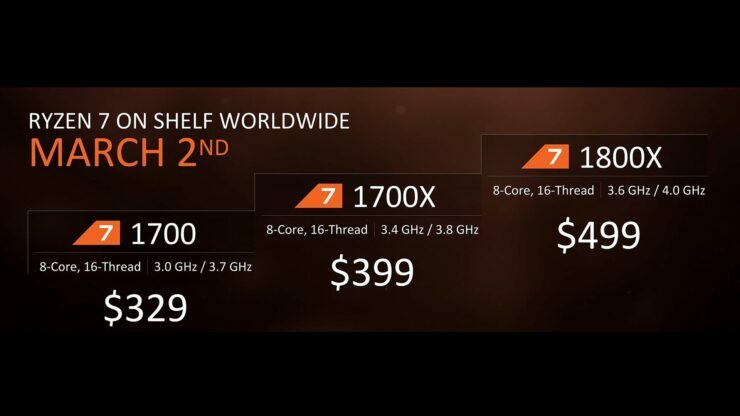 AMD’s most affordable Ryzen 7 8-core CPU has been overclocked to 4GHz on all 8 cores. With decent motheboards and cooling this $329 chip is said to be capable of outperforming the flagship $499 Ryzen 7 1800X and Intel’s $1050 i7 6900K. OCUK staffer “Gibbo” reports successfully overclocking a retail Ryzen 7 1700 processor with an ASUS Crosshair VI Hero motherboard to 4.05GHz on all 8 cores. With this overclock the CPU would effectively be running 450MHz higher than the Ryzen 7 1800X flagship, which is very impressive considering the huge price delta between the two chips as well as the low 65W TDP of the 1700. “Gibbo” estimates, based on his results, that the 1800X should be able to hit 4.3GHz on all 8 cores. We just tested a 1700, it hit 4.0GHz stable in everything, but ONLY in the Crosshair mainboard, the lower-end boards it was hovering around 3.80GHz as the VRM’s were cooking with extra voltage. It however was maxing around 4050MHz, so I’d say 1700 can do 3.9-4.1GHz, of course the 1800X will probably do 4.1-4.3 as no doubt better binned, but if your clocking the motherboard has a big impact on the overclock and so far Asus Crosshair and Asrock Taichi seem the best two. Gibbo confirmed in a later comment that this overclock was achieved with a 240mm Asetek built liquid cooler, which is similar to the popular Corsair H100i. Overclocking is a huge deal with Ryzen because each chip is unlocked. 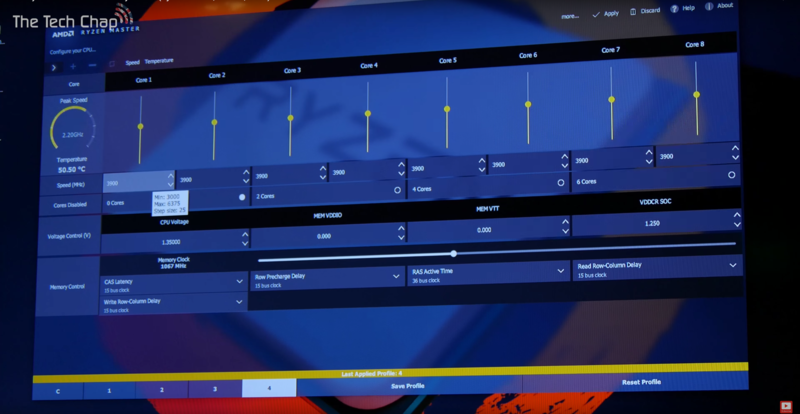 Allowing users to extract more performance out of any Ryzen chip they choose to buy. Making the value proposition considerably more attractive for any person willing to do it. Ryzen’s instructions per clock are significantly higher than anything AMD ever had before. In fact, according to the latest benchmarks Ryzen offers even better single-threaded performance/clock than Intel’s Kaby Lake. This in turn means that increasing the frequencies even by a little bit can make a huge difference. At 4.05GHz on all 8-cores an overclocked Ryzen 7 1700 effectively outperforms every other desktop 8-core CPU on the market. Including Intel’s $1000+ Haswell-E and Broadwell-E i7 5960X and i7 6900K. One thing that we shouldn’t fail to mention is that all of the results we’re seeing, including the record breaking performance of an overclocked Ryzen 1800X is only the tip of the iceberg. These chips are fresh off the production line and how high they can clock will only get better as the 14nm LPP process AMD is using matures. It’s impressive enough that the company can already get its first ever 14nm CPU iteration to hit 4.0GHz straight out of the gate. It took Intel several years before its 14nm process was mature enough to produce quad-core CPUs that can hit 4.0GHz, let alone 8-core chips. We won’t know how far the Ryzen 7 1700, 1700X and 1800X can overclock until more people get their hands on them which shouldn’t be too long, as they’ll ship to buyers on March 2nd and the embargo on reviews will end on the same day. How much variability we’re going to see from one chip to the other is going to be very interesting to see. AMD has already shipped over one million Ryzen processors to meet the pre-order demand and when you have one million of anything there’s bound to be some degree of variability. Once we get our own Ryzen chip in the lab we’re going to run it through its paces, so stay tuned!